The ministry started out in 1976 as House Services. The saints would go from house to house having prayer meetings and church services. Many souls were saved and added to our house ministry and eventually, the houses were too small for the growing number of saints attending. In 1983, we rented space from another church when they didn’t have service. The Lord made a way for us to fellowship for the time being because He was doing a great work and He chose our ministry to help add to His kingdom. We later moved to a store front on Gen. Meyer in Algiers in 1984. We had some good church in that little space. We praised and worshipped God like we were in a great cathedral. Once we outgrew that building, we moved to a larger space at 627 Opelousas Avenue in 1985. Many more souls were added to the ministry and God continued to reveal Himself and His plans to the Leaders of the ministry. God elevated us in many ways. In 1986, House of Deliverance Church was officially incorporated. We were on our way. The Lord continued to move us up spiritually and He showed us a larger building that required much work, but had so much potential. The leaders had a vision of a new edifice and we were blessed to labor with our own hands to renovate and remodel the new building. What we could not do on our own, God sent someone out of nowhere to offer their expertise and services. Strangers helped us finish the building. God breathed upon us and we were able to move to our current house of worship, 732 Opelousas Avenue, in 1989. We have definitely blessed God in many different places and we are certain that this will not be the last! We have a vision of yet another House of Worship and you are welcome to come and be a part of our growing family. 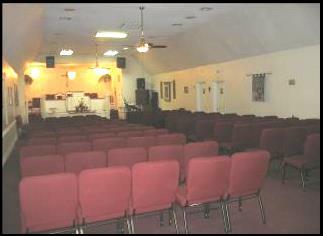 We are a small congregation, but there is always room for you! HOUSE OF DELIVERANCE CURCH, INC. It has been a long journey to this point, but we are not tired yet! There is more that God has prepared for us and we plan to continue in the faith.